Psoriasis is a common inflammatory skin disorder characterized by itchy erythematous papules and plaques topped with silvery white scales. It has a chronic relapsing course and is associated with significant morbidity and reduction in the quality of life. Therapy of psoriasis is challenging. Topical therapy forms the first line of treatment for stable plaque psoriasis affecting a limited body surface area and in extensive disease systemic agents are indicated. All these drugs have inherent side effects, and none bring prolonged remission of the disease. The other therapeutic modality for psoriasis is phototherapy, but it is delivered through a specialized machine which can be available only at referral centers. Biologics have revolutionized the management of psoriasis as they can bring a remission of disease up to several years. Although limited availability and high cost prohibit their regular usage, Indian dermatologists are rapidly adopting biologics in the treatment of psoriasis. Psoriasis is a common inflammatory skin disorder characterized by itchy erythematous papules and plaques topped with silvery white scales. It may affect any body part including scalp and nails. It may affect the skeletal system in the form of “psoriatic arthropathy,” which may or may not coexist with skin lesions. About 2%–3% of the world's population is affected by the disease. It has a chronic relapsing course and persists for the lifetime of an affected individual. Hence, it is associated with significant morbidity and reduction in the quality of life in terms of personal and social interaction. Therapy of psoriasis is challenging. Whatever therapeutic modality may be used, the disease may go for remission but relapses at regular intervals (seasonal exacerbation) or otherwise. Till few years back, there was no treatment for psoriasis which prolongs the duration of remission in these patients. Topical therapy forms the first line of treatment for stable plaque psoriasis affecting a limited body surface area (BSA). In patients with extensive disease systemic agents are indicated. Methotrexate is the most commonly used systemic agent because of its proven efficacy and affordability but is associated with systemic toxicity on prolonged usage. Other common systemic drugs used in psoriasis are acitretin and cyclosporine-A. Systemic retinoids are contraindicated in females of reproductive age-group, and cyclosporine-A are indicated in specific clinical situations. All these drugs have inherent side effects and none bring prolonged remission of the disease. The other therapeutic modality for psoriasis is phototherapy and photochemotherapy. Photochemotherapy is a therapeutic method in which psoralens are used in combination with ultraviolet-A (UVA). Psoralens are compounds that sensitize cells to the effects of UVA light. Depending on the source of UVA, it can be psoralen + UVA (PUVA) (artificial phototherapy unit) or PUVA sol (sunlight). PUVA therapy requires a UVA machine and can only be administered at higher centers whereas in PUVAsol the dose of UVA cannot be adjusted accurately. The current phototherapeutic modality for widespread psoriasis is narrow-band ultraviolet-B (NB-UVB) therapy. The main advantage of NB-UVB phototherapy is that it is free of the adverse effects associated with systemic drugs. However, this therapy can be delivered through a specialized machine which can be available only at referral centers. Biologics have been introduced in the therapy of psoriasis in the past decade. The introduction of biologics has revolutionized the management of psoriasis, and new molecules are continually being added to this group. Biologics target specific points in the inflammatory pathway without interacting with other proteins hence they are associated with fewer systemic adverse effects. These are considered unique in the treatment of psoriasis as longer remission period can be expected. In developing countries like India, cost of these therapeutic agents is the prohibitive factor for regular usage. However, Indian dermatologists are rapidly adopting biologics in the treatment of psoriasis. In the following section role of biologics in the therapy of psoriasis will be discussed. US Food and Drug Administration defines “biologic” as an agent derived from living material (human, plant, animal, or microorganism) used for the prevention, treatment or cure of disease in humans. In general, it refers to protein molecules therapeutically used to target specific points of the immunological processes. Biosimilars are biological products designed to be highly similar to the reference innovator drug. Their efficacy and safety profile is similar to the reference molecule. The emergence of biologics has brought about a significant progress in the management of psoriasis. Herein, we briefly discuss the indications, various types, and adverse effects associated with the biologics used for the treatment of psoriasis in general. Biologics are indicated in patients who fulfill the eligibility criteria as given below. However, a thorough assessment of the patient regarding risks and benefits should be made before administering the biologic. Eligibility criteria: Patient must have severe disease as defined in (a) and fulfill one of the clinical categories listed in (b). Have severe, unstable, life-threatening disease. †	Standard systemic therapy includes cyclosporine (2.5 mg/kg daily; up to 5 mg/kg daily), and in men and women not at risk of pregnancy, methotrexate (single dose [oral, subcutaneous, intramuscular] 15 mg weekly; maximum 25 mg weekly) and acitretin (25–50 mg daily). Electrocardiogram and echocardiography (if indicated). Yearly Mantoux test/IGRA and periodic CH and LFT. Various biologics currently used in the treatment of psoriasis have been listed in [Table 1]. The biologics and biosimilars which are currently available in India will be discussed in this article. Tumor necrosis factor (TNF) is a proinflammatory cytokine which plays an important role in the pathogenesis of psoriasis. It exists in two forms, soluble TNF (sTNF) and cell surface bound precursor transmembrane TNF (tmTNF) both of which are biologically active. They bind to either of the two TNF receptors leading to nuclear factor-kappa B activation and promote inflammation and/or apoptosis. In addition, tmTNF itself can act as a ligand to induce cell activation, cytokine suppression, or apoptosis of the tmTNF bearing cell through a reverse signaling process. Inducing tmTNF mediated reverse signaling processes. 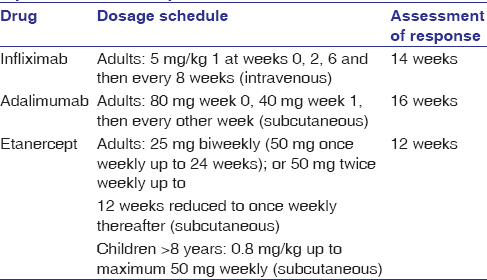 The dosing schedules of TNF-α inhibitors in psoriasis are summarized in [Table 2]. TNF-α inhibitors are generally considered safe and cause nonlife-threatening adverse effects, but occasionally they may be severe. The adverse effects caused by TNF-α inhibitors are listed in [Table 3]. Malignancies diagnosed and treated more than 5 years previously (where the probability of total cure is very high). Hepatitis B and C virus infection. Itolizumab is a humanized IgG1 monoclonal antibody developed in India (Alzumab, Biocon Limited, Bangalore, India). It is approved in India and Cuba for the treatment of moderate to severe plaque psoriasis. Itolizumab selectively binds to CD6, a pan-T-cell marker causing downregulation of priming and activation of T-cells leading to reduction in synthesis of pro-inflammatory cytokines and chemokines. Recommended dose of itolizumab for the treatment of plaque psoriasis is 1.6 mg/kg given as intravenous infusion once every 2 weeks for 12 weeks, followed by 1.6 mg/kg every 4 weeks up to 24 weeks. Infusion reactions, infections and rarely exfoliative dermatitis, erythrodermic psoriasis, adjustment disorder with anxiety and bacterial arthritis. Secukinumab is a recombinant, fully human antibody that selectively binds and neutralizes interleukin (IL)-17A. IL-17A is the primary effector of type 17 helper T (Th17) cells, however, in psoriatic lesions, it is secreted by other cells such as γδ T-cells, neutrophils, and possibly mast cells also. IL-17A acts as the master cytokine in the pathogenesis of psoriasis as it stimulates keratinocytes to secrete chemokines and other pro-inflammatory mediators that recruit additional inflammatory cells, including neutrophils, Th17 cells, dendritic cells, and innate lymphoid cells. In comparative studies, secukinumab was found to be more effective than etanercept and ustekinumab in clearing the psoriatic lesions and improving the patients' quality of life. Recommended dosage is 300 mg (subcutaneous injection) at weeks 0, 1, 2, 3, and 4 followed by 300 mg every 4 weeks. For some patients, a dose of 150 mg may be acceptable. Nasopharyngitis, diarrhea, upper respiratory tract infection, inflammatory bowel disease, and increased risk of candida infection. Previous serious hypersensitivity reaction to secukinumab or to any of the excipients, chronic or a history of recurrent infection and inflammatory bowel disease. Ixekizumab is a humanized monoclonal antibody indicated for the treatment of adults with moderate to severe plaque psoriasis. It also acts by inhibiting IL-17A like secukinumab. It is administered at a dose of 160 mg (two 80 mg injections) at week 0, followed by 80 mg at weeks 2, 4, 6, 8, 10, and 12, then 80 mg every 4 weeks subcutaneously. Adverse effects and contraindication are similar to secukinumab. Ustekinumab is a fully human monoclonal antibody that binds the shared p40 subunit of IL-12 and IL-23. These cytokines are secreted by antigen-presenting cells and are important mediators of the differentiation of naive T-cells into Th1 and Th17 cells. It also inhibits IL-12-and IL-23-induced IFN-ϒ, IL-17A, TNF-α, IL-2, and IL-10 secretion. It is administered based on weight at 45 mg (≤100 kg) or 90 mg (>100 kg) by subcutaneous injection at weeks 0 and 4, then every 12 weeks thereafter. Injection site reaction, headache, nasopharyngitis, and upper respiratory tract infections are the most common adverse effects associated with ustekinumab. Ustekinumab is currently not available in India. Brodalumab is a fully human monoclonal antibody which targets the IL-17 receptor A (IL-17RA). It inhibits binding of IL-17A and IL-17F to the IL-17RA. Recommended dosage is 210 mg by subcutaneous injection at weeks 0, 1, and 2 followed by 210 mg every 2 weeks. Arthralgia, headache, fatigue, diarrhea, oropharyngeal pain, myalgia, injection site reactions, influenza, neutropenia, and tinea infections are the most common reported adverse effects. It is contraindicated in patients with chronic or history of recurrent infections and Crohn's disease. Biologics represent the future of therapeutics in psoriasis. This group of therapeutic agents induces long-term remission in long-standing psoriatic patients. These are the drugs of choice in systemic therapy-resistant cases of psoriasis or patients who have developed significant side effects related to long-term anti-psoriatic therapy. Psoriatic arthritis, an incapacitating disease in some patients responds miraculously to these agents. Secukinumab is the latest agent in the biologic therapy of psoriasis. It is relatively safer as compared to earlier biologics and may bring a remission of disease up to several years. In a resource poor country like India limited availability, high cost and no insurance coverage for the use of these agents are the constraints for their utilization. These drugs have been in wide use in large cohorts of white-skinned patients in various western countries. However, Indian data on the use of biologics in psoriasis are sparse, available from the premier institutions and metropolitan cities. Large-scale and long-term data on the use of biologics among patients with psoriasis in India may be available in future so that its safety among brown-skinned individuals can be determined. Menter A, Gottlieb A, Feldman SR, Van Voorhees AS, Leonardi CL, Gordon KB, et al. Guidelines of care for the management of psoriasis and psoriatic arthritis: Section 1. Overview of psoriasis and guidelines of care for the treatment of psoriasis with biologics. J Am Acad Dermatol 2008;58:826-50. Lee MR, Cooper AJ. Biologic agents in psoriasis. Australas J Dermatol 2006;47:217-29. Patel PK, King CR, Feldman SR. Biologics and biosimilars. J Dermatolog Treat 2015;26:299-302. Smith CH, Anstey AV, Barker JN, Burden AD, Chalmers RJ, Chandler DA, et al. British Association of Dermatologists' guidelines for biologic interventions for psoriasis 2009. Br J Dermatol 2009;161:987-1019. Rajagopalan M, Mital A. Biologics use in Indian psoriasis patients. Indian Dermatol Online J 2016;7:489-97. Krupashankar DS, Dogra S, Kura M, Saraswat A, Budamakuntla L, Sumathy TK, et al. Efficacy and safety of itolizumab, a novel anti-CD6 monoclonal antibody, in patients with moderate to severe chronic plaque psoriasis: Results of a double-blind, randomized, placebo-controlled, phase-III study. J Am Acad Dermatol 2014;71:484-92. Budamakuntla L, Madaiah M, Sarvajnamurthy S, Kapanigowda S. Itolizumab provides sustained remission in plaque psoriasis: A 5-year follow-up experience. Clin Exp Dermatol 2015;40:152-5. Thaçi D, Blauvelt A, Reich K, Tsai TF, Vanaclocha F, Kingo K, et al. Secukinumab is superior to ustekinumab in clearing skin of subjects with moderate to severe plaque psoriasis: CLEAR, a randomized controlled trial. J Am Acad Dermatol 2015;73:400-9. Syed YY. Ixekizumab: A review in moderate to severe plaque psoriasis. Am J Clin Dermatol 2017;18:147-58. Leonardi CL, Kimball AB, Papp KA, Yeilding N, Guzzo C, Wang Y, et al. Efficacy and safety of ustekinumab, a human interleukin-12/23 monoclonal antibody, in patients with psoriasis: 76-week results from a randomised, double-blind, placebo-controlled trial (PHOENIX1). Lancet 2008;371:1665-74. Nakagawa H, Niiro H, Ootaki K; Japanese brodalumab study group. Brodalumab, a human anti-interleukin-17-receptor antibody in the treatment of Japanese patients with moderate-to-severe plaque psoriasis: Efficacy and safety results from a phase II randomized controlled study. J Dermatol Sci 2016;81:44-52.